The plan to build the Veneto Club’s headquarters on about 16 acres of land on Bulleen Road, in Bulleen, is extremely optimistic, if not a little ambitious, according to some. When the entire social and recreational centre is completed, it will be a symbol of pride for not only Veneto natives, but the Italian community at large. The project was drafted by Italian architect Erminio Smrekar upon a specific request made by the Veneto Club’s management, which indicated the exact elements that should be included in the plan. In a members’ meeting, the plan was approved unanimously and the committee earmarked around $20,000 on top of the $33,000 already dedicated to the project. This week, we were able to take a look at the plan and we can now outline it in more detail than we could in the previous edition. The first issue Smrekar faced was regarding the nature of the land itself, which could be vulnerable to flooding due to its proximity to the Yarra. Therefore, the building is based on a series of pillars, transformed into decorative elements. An outdoor staircase leads to a raised floor where, in the central part of the building, sporting areas are located: a gym, two squash courts, a sauna, massage rooms, table tennis rooms, a playroom for children. Toilets and changing rooms are on the ground floor. The central area is surrounded by a covered balcony. Those on the front and rear of the building are for the simple purpose of transiting, while those on the sides are larger and serve as terraced bars with two kiosks serving alcoholic beverages. They could also serve as stands from which spectators can watch sporting events unfold on the levels below. Aside from the central staircase, four others are located at the building’s four corners. They lead to the first floor, where there are social and recreational facilities and offices, including: the president’s office, the director’s office, a conference room, a library, administration offices, a ladies’ lounge, a cocktail lounge, a function room with a stage, a restaurant and bar, a games room and pool room, the kitchen, bathrooms, and an apartment for the caretaker. Outdoor sporting facilities include: 12 bocce courts, two pools (one for adults and one for children), four tennis courts, a children’s area and a large space for parkland and gardens. The moveable partitions which separate the function room from the games room can be removed to cater to larger social events of up to 1000 people. The entire indoor area is 30,000 square feet. The layout of the various rooms and facilities is rational and functional. 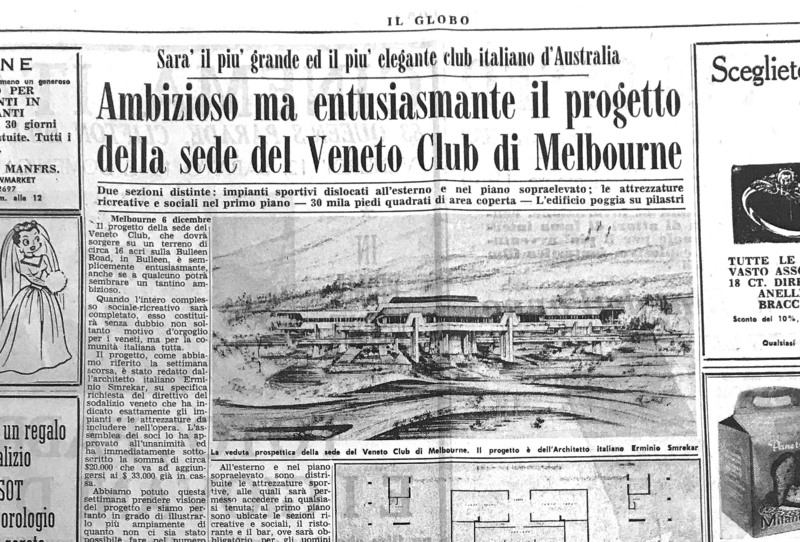 As we mentioned earlier, it’s an ambitious project – however, it’s for this very reason, and the enthusiasm with which it has been presented, that it will gain the support of the community of Veneto in Melbourne. Meanwhile, the Veneto Club’s committee members are completing the final details of the plan before executing it, and organising the project’s funding. The building should be completed by Christmas 1970. This story appeared in the Tuesday December 9, 1969 edition of Il Globo.